Many moons ago, Joey and I went on our honeymoon to a wonderful resort in St. Lucia. There was a library there, and I borrowed the book Julie and Julia to read while we relaxed on the beach every day. Never having heard of food blogs before, I thought they were a pretty revolutionary idea, and the wheels started turning in my head. Having received The Barefoot Contessa at Home as a wedding gift, I thought it would be a fun idea to cook my way through it a la Julie Powell. However, as soon as we got home and I looked into it, I saw that I was about two years too late. There were already tons of food blogs out there. I pushed starting a blog to the back burner, but I started cooking my way through The Barefoot Contessa at Home at a voracious pace anyway. That summer I probably made half the recipes in her cookbook, and we loved them all. This grilled tuna salad was first up, and I made it one Saturday night when we had some friends over for dinner. It was the beginning of summer, and this grilled salad was a really nice light dinner - paired with a green salad, some good bread, and crisp white wine, it was perfect for entertaining friends on the deck. I've made it a few times since then, and I'm so happy to share it with you now. This salad is the reason I fell in love with Ina Garten's recipes. Seemingly simple ingredients combined in a way to create a truly special meal. 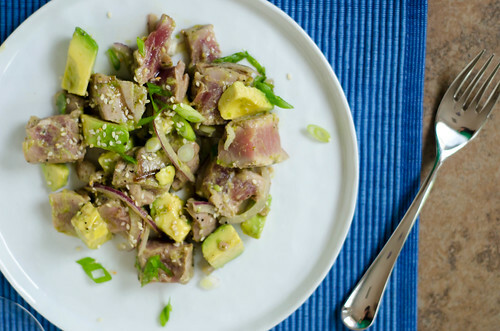 Avocado, onion, and scallions don't seem like anything special, but mixed with seared tuna and a wasabi-lime vinaigrette, this salad is elevated to a meal worthy of a special occasion. It's also very quick and easy - as the grill is preheating, mix up the vinaigrette, chop the veggies, and toast the sesame seeds. Quickly grill the tuna (with a glass of wine in hand, of course), then chop the avocado and fish, toss it all together, and serve. As Ina would say, "How easy is that?" I only grilled enough tuna for Joey and myself, but for the kids, I used grilled shrimp and chopped mango. It was a great alternative for the grilled tuna, and a combination I'll definitely be using in the future. If you don't have a grill, the tuna can also be seared on the stovetop. In a dry sauté pan over high heat, cook the tuna 2-3 minutes per side, turning once. Meanwhile, brush both sides of the tuna steaks with olive oil, and season liberally with salt and pepper. To toast the sesame seeds, place them in a dry sauté pan, and cook over medium-low heat, tossing often, until they are golden-brown, 5-10 minutes. Remove them from the pan as soon as they are done, or they will burn. Mix the vinaigrette: In a small bowl, whisk together 1/4 cup of olive oil, lime zest, lime juice, wasabi powder, soy sauce, honey, hot sauce, 1 tsp kosher salt, and 1/2 teaspoon of pepper. Taste and adjust seasonings as needed. For the tuna, brush the grates of the grill with oil. Place the tuna on the grill and cook 2-3 minutes per side. Remove to a plate. The tuna should be seared on the outside and raw in the center. Allow to cool slightly, and chop into 1-inch cubes. Meanwhile, chop the avocado into large bite-sized pieces and toss with the tuna, onion, scallions, and most of the wasabi-lime dressing. Divide among individual serving plates and drizzle with additional dressing and sprinkle with sesame seeds. Serve at room temperature. A few weeks ago, we made the trek to my hometown of McDonough, Georgia to visit my family. While we were down there, we met my dad and his wife at Southern Belle Farm for some strawberry picking! 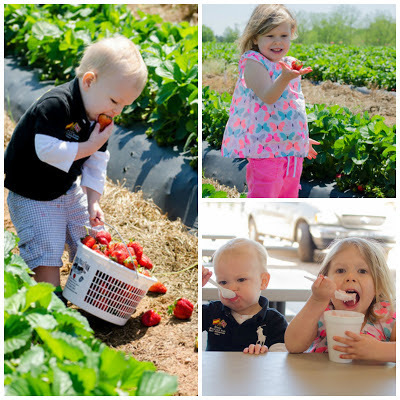 Caroline and Smith were both really excited to pick the berries this year: Caroline proclaimed every berry she picked to be "the most perfect strawberry ever," and Smith was very involved in the quality control testing. We left with two gallons of strawberries and bellies full of homemade strawberry ice cream. I of course already had more recipe ideas than I did strawberries, and sadly, I barely made a dent in my list. 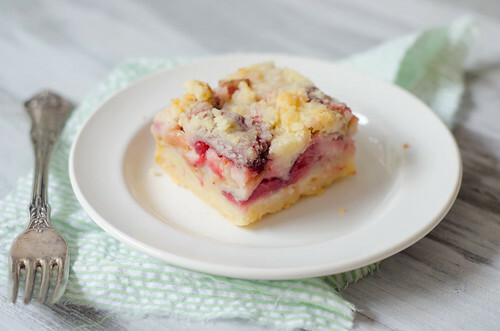 However, I used the last of the berries to make these strawberry-rhubarb pie bars, and they were definitely a great use of those beautiful strawberries! I used the base of these blackberry pie bars and adapted the filling to suit the new flavors. The result was a fantastic dessert: a buttery crust that transforms into a sweet, custardy filling, with the slightest sour notes from rhubarb, and finally topped with more buttery, crumbly crust. The crust kind of fades into the filling, creating an ombre of flavor and texture. Absolutely delicious! My dad's favorite dessert is strawberry-rhubarb pie, so I feel like I should have waiting to post these before Father's Day, but I guarantee these will be a hit with any moms in your life as well. Or anyone in your life for that matter! makes one 9x13 inch pan. Reserve 2 cups of the mixture to use as the topping. Press the remaining mixture into the bottom of the pan, and bake 12-15 minutes. Cool for at least 10 minutes. To make the filling, whisk the eggs in a large bowl, then add the sugar, buttermilk, flour, salt, lemon zest, and vanilla extract. Gently fold in the berries and rhubarb and spoon the mixture over the crust. Sprinkle the remaining flour mixture evenly over the filling, and bake 55 to 65 minutes. For some reason, I cannot think of bundt cakes without immediately breaking into Sir Mix-a-Lot's "Baby Got Back." I like big bundts and I cannot lie.... anyone else? Just me? This of course reminds me of the Friends episode where Ross sings it to Emma to make her laugh, and then I get tickled because Joey sings it to Tucker and Henry to make them laugh as well. Any other inappropriate parents out there? Just us? .... moving right along.... This bundt cake is pretty awesome. 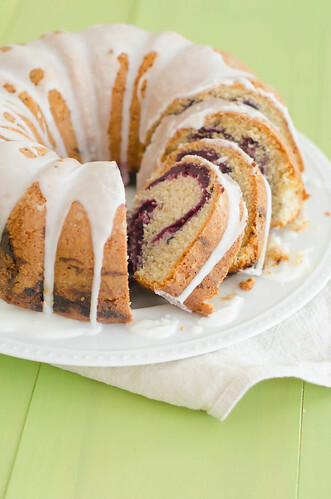 It's a standard cake that's swirled with a blueberry jam of sorts, laced with subtle lemon and cinnamon flavors, and then drizzled with a sweet lemon glaze. For some reason, half the time when I bake with blueberries, they all sink to the bottom of the baked good. Half the time they are perfect. And I cannot for the life of me figure out what causes it. I've tried the "toss in flour" trick, and it's inconsistent. So the nice thing about this cake is that you get all the flavor of blueberries, without the annoyance of them all being in the bottom of the cake - plenty of blueberry flavor suspended throughout the cake. The solution to the problem of the sinking blueberries was to whip of a quick jam. Fresh or frozen blueberries are briefly cooked with sugar, lemon juice, and pectin to make the filling. It is swirled into the batter twice - once in the middle, then again at the end. Not only do you get blueberries in every bite, but it also looks pretty! Summer berries are on the horizon, and while I made the cake with frozen wild blueberries this time, I know I'll be using fresh soon enough! This cake makes a nice simple dessert... or an indulgent snack... or a special breakfast. Mother's Day is this weekend, and I would venture to guess that not many moms would turn this down! For the cake: Preheat the oven to 325 degrees and adjust the rack to the lower-middle position. Butter and flour a 12-cup nonstick bundt pan. Set aside. In a large mixing bowl bowl whisk together the flour, baking powder, baking osdea, salt, and cinnamon. Whisk together the buttermilk, lemon zest, and lemon juice in a medium bowl. In a third bowl (or large liquid measuring cup), gently whisk the eggs + yolk to combine. In a stand mixer fitted with a paddle attachment, beat the sugar and butter at medium-high speed until pale and fluffy, about 3 minutes. Scrape down the bowl as needed throughout. Reduce the speed to medium and add half of the eggs, beating just until incorporated. Scrape down the sides of the bowl and add the remaining eggs. Reduce the speed to low and add one-third of the flour mixture, followed by half of the buttermilk mixture, mixing only about 5 seconds after each addition. Repeat using half of the remaining flour mixture, all of the buttermilk mixture, and the last of the flour. Scrape down the bowl and mix at medium-low speed about 15 seconds. Remove the bowl from the mixer and use a spatula to fold the batter once or twice to incorporate any remaining flour. Cover the bowl with plastic wrap and set aside while you prepare the blueberry filling. For the filling: Whisk the sugar, pectin, and salt together in a small saucepan. 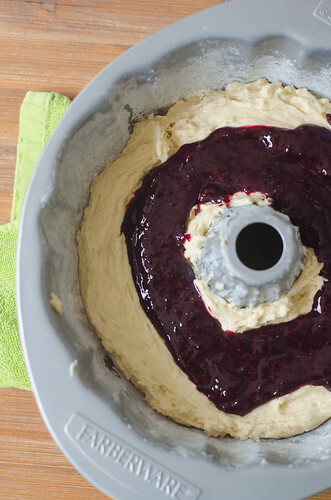 Use a blender or food processor to puree the blueberries until they are mostly smooth, about 1 minute. Transfer 1/4 cup of the puree plus the lemon zest to the saucepan and stir to combine. Cook over medium heat until just simmering, about 3 minutes, stirring often to dissolve the sugar and pectin. Transfer the mixture to a medium bowl and allow to cool 5 minutes. 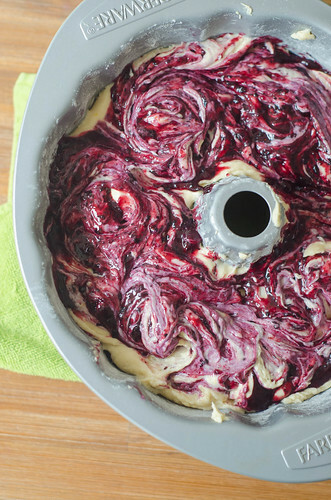 Stir in the remaining blueberry puree and lemon juice and whisk to combine. Let sit until slightly set, about 8 minutes. Spoon half the batter into the prepared bundt pan smooth the top with a spatula or spoon. 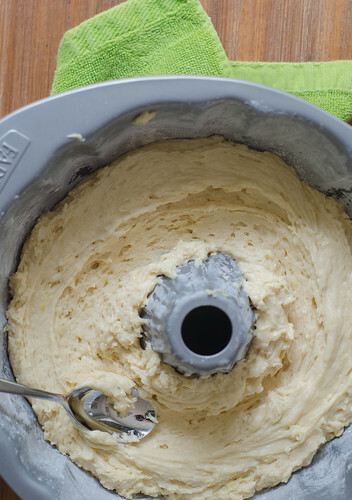 Using the back of a spoon, create a 1/2-inch-deep channel in the center of the batter. Spoon half the filling into the channel. Using a butter knife, swirl the filling into the batter - there should be no large pockets of filling remaining. Repeat the swirling steps with the remaining batter and filling. Bake until the top is golden brown and a skewer inserted into the center comes out clean, 60 to 70 minutes. Cool the cake for 10 minutes in the pan, then carefully invert onto a wire rack to cool completely. To make the glaze, whisk together the lemon juice and sugar. Pour over the cooled cake, allow to set for at least 10 minutes, and serve.